Men aren’t immune to common scalp condition. In fact, some conditions like scalp eczema are more common among men than women. Anyone experiencing itching, flaking, and redness on their scalp knows how uncomfortable and embarrassing it can be. That’s why Krieger & Sohne have created K + S Salon Quality Men’s Shampoo. Sometimes, it’s easy for men to think they don’t need specialized shampoos or hair care products. Salon products are often marketed toward women. Even if the formulas work the same on men, it’s hard to find a male-specific product. This shampoo changes that. The formula is designed with a man’s hair and scalp in mind. It’s a shampoo that is gentle enough to use every day, but strong enough to prevent common scalp conditions. What Makes It a Good Shampoo for Men? How Does It Help the Hair & Scalp? Does It Take Much Time to Use? This review will cover K + S Salon Quality Men’s Shampoo. The shampoo is formulated for men, but how does it hold up against our criteria? We’ll answer several of those questions, so you can make an informed decision on whether or not this is the right shampoo for you. Tea tree oil is a common ingredient in many healing and therapeutic hair products. It has anti-inflammatory, antiseptic, antifungal, and antibacterial properties. It has been used for years in health and medicine, due to its healing properties. K + S uses the story of Captain James Cook’s use of the tea tree to connect it with the shampoo. They focus on Cook’s ‘manly’ achievements, as well as the use of tea tree in wartime to heal wounds. 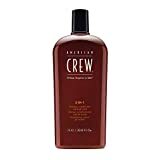 So, while it’s mostly marketing that makes this a shampoo for men, it’s also a way to get more men to use the necessary products that can help with scalp and hair conditions. It’s not always easy for a man to pick up a salon product when it’s marketed toward women. K + S understands the importance of men’s scalp health. That makes this product unique, relevant, and important. This quality men’s shampoo is designed to work on all hair types. It doesn’t matter if you have thick hair or thin hair, or what ethnicity you may be. It can be used as an everyday shampoo to maintain healthy hair and a healthy scalp. You can also use it to supplement other hair products as a detoxifying agent. It is meant to restore your scalp and hair to a healthier state. Because of its powerful natural ingredients, it can help with dry scalp and flaking. No one wants to deal with the embarrassment that can come with a flaky scalp. Dandruff/flakes on your shoulders and clothes is just as much a problem for men as it is for women. Instead of having to use some expensive treatment or medicated shampoo, daily use of this K + S brand can make a big difference. Whether you have a mild dry scalp or a more severe skin condition like seborrheic dermatitis, this shampoo can help to soothe your symptoms. Because K + S offers a full line of hair care products to complement this shampoo, you can take the health of your scalp to the next level, following it up with conditioner, foaming cream, styling gel, etc. While the company chooses to focus mainly on the tea tree oil in this shampoo, there are other active ingredients to consider. Keep in mind that this is not an all-natural shampoo. It does contain some man-made ingredients. However, it does not contain any additives. The combination of these ingredients and the rest of the ingredients in the formula can get your scalp and hair back to a healthy state. The company even states it can be used to ‘heal your hair,’ rinsing away any damage you’ve done to it in the past, and starting fresh. Every time you use it, you’re detoxifying from other products you’ve used in the past. By combining it with other K + S products, you can completely change the health of your standard hair care routine. Because the shampoo contains no harmful additives, the chances of experiencing any adverse side effects are slim. If you are aware of any potential reactions you might have due to the ingredients, it’s probably not for you. Unlike some treatments for dry scalp, you can use this shampoo as you would any other regular shampoo. It was made for men with busy schedules, so you don’t need to take extra time out of your routine for it to work. Because of its ease of use, it’s meant to be an everyday shampoo that you can use to fight an itchy scalp and end up with soft, healthy hair. The brand name itself, ‘Krieger,’ actually means warrior. This shampoo is designed for the busy man who wants to take care of his hair with salon-quality products at home. Rinse hair completely to moisten. Massage a small amount of the shampoo through your hair, making sure to massage your scalp as well. For extra benefits, leave in for 3 to 5 minutes. Follow up usage with a conditioning product to lock in moisture. Because the shampoo contains no harmful additives, it’s safe enough to use each day without drying out your hair and leaving you with an itchy scalp. It can become a normal part of your everyday routine. K + S is so confident about what it can do for men’s hair and scalp health, that they offer a satisfaction guarantee. This consists of a complete refund with no questions asked. In fact, nothing even needs to be defective or wrong with the product for you to receive your refund. If you try out the shampoo for awhile and discover it’s simply not what you were looking for, you can return it. It’s easy to hear the word ‘salon’ and think of a hefty price tag. It’s true that many salon-quality products are expensive, even for men. If you were to walk into a hair salon and buy a scalp-cleansing product, it’s likely it would cost twice as much as K + S shampoo. However, just because the product is less expensive than traditional salon products, it doesn’t mean it’s less effective. With many positive reviews, some people say they’ll never go back to another shampoo again. Plus, consider the money-back guarantee the company offers. Not many products you buy in an actual salon come with a guarantee like that. It allows you to purchase the shampoo with confidence, knowing you can get a full refund if you don’t like it. That alone offers quite a bit of extra value. 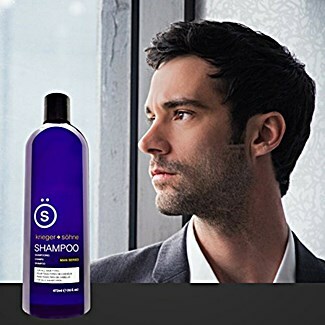 CLICK HERE to Check the Current Price of This Men’s Shampoo on Amazon! Added benefits consist of things that may not affect the product directly, but can help you to feel more confident in what you’re buying. K + S makes their standpoint on several important issues very clear. First, they make sure their customers know their products are made in the United States. Second, they assure their customers that none of their hair care products are ever tested on animals. Again, these don’t necessarily affect the products themselves, but they add an extra peace of mind for many people. The fact that they take the time to share some of their ethical values with their customers adds value and trust. While this shampoo’s formula has received outstanding reviews from most of the men who use it, it’s important to make sure it’s the right shampoo to fit your needs. Let’s go over some of the basic pros and cons of the product, so you can make a more informed decision before buying. There are no chemical additives to strip your hair of nutrients. It helps to revive dry scalp and create healthy, shiny hair. The formula is designed for everyday use without damaging your hair. It contains natural healing ingredients like tea tree oil. Some men have tried to use it for hair loss, which it does not treat. In extreme cases of dandruff or dry scalp, it can take several weeks for flaking to subside with regular use. Will K + S Salon Quality Men’s Shampoo help get rid of dandruff and dryness? Yes. The tea tree oil and other soothing ingredients in the shampoo can deal with a dry scalp and the flakes that go along with it. If you have a more severe skin condition, it may take extra time for the shampoo to be effective. You may also need to look at supplemental treatment options. There are multiple treatment options for guys dealing with a dry scalp, flaking, or unhealthy hair. However, they can be expensive, harsh on hair, and many of them aren’t targeted toward men, specifically. While the branding of a product doesn’t make it better, it’s rare to have a hair care product that is specifically designed for the health of a man’s scalp and hair. It’s very clear that the concept of K + S products goes far beyond their marketing. They take the ‘art of manliness’ very seriously when they formulate their shampoo. For example, it starts with tea tree oil, and the company is quick to explain how tea tree oil has been used by strong, successful men for years. If you’re a gentleman who has been looking for a salon-quality product without the heavy expense, this is a great option. We hope this review has made your decision to buy a treatment shampoo easier. Hold on to your wallets, gentlemen. We don’t want you to buy anything without having full confidence in the product. That is exactly why we always tell our readers that they should take the time to read through some real customer reviews that have been posted online before buying anything. Customer reviews are a great way to learn more about a product. For the K + S Salon Quality Men’s Shampoo reading reviews enables you to learn from other guys just how effective the shampoo is at fighting dry scalp and whether it’s worth the price. People are brutally honest in their reviews, so it’s an excellent way to find out more. Many men have commented about the quality of K + S shampoo. They claim that it has helped make their hair feel thicker and stronger, reduced dryness, eliminated itching, and made their scalps feel much better. Overall, most men agree that this is the shampoo to get if you’re having problems with dry scalp and your hair health. CLICK HERE to Read Customer Reviews, View FAQs, and Check Current Prices!